A society of well-meaning older birds has taken upon themselves the task of ensuring that every young bird lives with a loving family of other birds. The society hears about Big Bird, a six-year-old yellow bird living on Sesame Street; Big Bird doesn’t live with other birds, but he still feels as though he has a family. 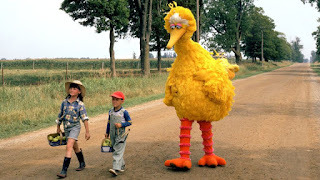 Miss Finch sets off from the Feathered Friends Board of Birds to find Big Bird; she convinces him that it will be wonderful to live with his “own kind,” and Big Bird agrees to go, much to the sadness of his Sesame Street friends. Not wanting to live without access to his friends, Big Bird runs away. His friends from Sesame Street learn this, and they set off to find him and bring him home. At the same time, Miss Finch sets out to find him and bring him back to the Dodos, and local circus owners The Sleaze Brothers set off to find him in hopes of capturing him and forcing him to perform for their audiences. Big Bird is adopted by the Dodo family; they don’t meet him until he comes off the plane, they immediately change his name, and they refuse him access to his former friends on account of his former friends not being birds. 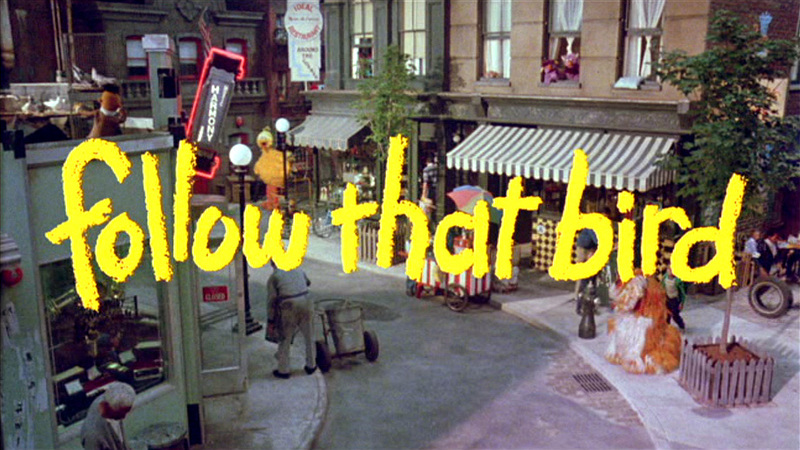 The film jumps right into adoption issues; the decision to remove Big Bird from Sesame Street is made even before the title screen is shown. The Sesame Street crowd tells Big Bird that they are his family. They love him, and are sad to see him go, although they support his ability to choose for himself. When they hear he is unhappy and lost, they set off to save and reclaim him. Miss Finch ultimately decides that Big Bird can stay in Sesame Street; he is cared for there, and she (rather self-righteously) declares that she has successfully placed another young bird in a loving family. It’s dangerous for kids to run away. Big Bird is caught by the Sleaze Brothers; they cage him and force him to perform. Big Bird tearfully asks some children to help him escape, and through their efforts, the Sesame Street crew learns where Big Bird is. The Sleaze Brothers nearly escape with him, but two of the Sesame Street grown ups pull off a brave rescue. 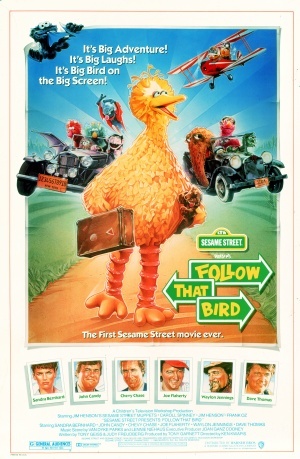 Although the message of the film seems to be that Big Bird’s family is the Sesame Street community, even though they’re not birds, the repeated refrain of several other characters in the film is that Big Bird must be with his “own kind,” and that might end up being what sticks with young viewers. In his displeasure with the Dodo family, he runs away, and they apparently never see him again. The Dodos are rather insensitive to Big Bird’s feelings of longing for his friends. Follow That Bird is an interesting offering; familiar Sesame Street characters handle adoption issues, social services, fear, and sadness in a theatrical feature. I could imagine the adoption-relevant elements of the story being confusing to the young viewers that the Sesame Street characters are most likely to interest. 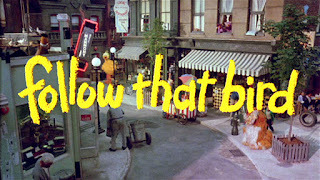 Kids in the 8-10 age range might be able to take some good from the film with a parent’s help – Big Bird’s family is the Sesame Street community that loves him; it’s OK if you don’t look like your family, and the film has enough of a plot to be interesting to kids in that 8-10 age range, if they’re not put off by the fact that it’s a Big Bird movie. For younger kids, a less confusing way to convey the film’s positive message might be the book A Mother for Choco by Keiko Kasza. Who is Big Bird’s family? How can you tell? Did Miss Finch mean to do good or bad? Where did she go wrong? Did the Sleaze Brothers mean to do good or bad? How can you tell? In what way were the Dodos a good family? In what ways were they not so good? Big Bird’s friends went to help him. Who are some of your best friends?